Based in the Netherlands, SENSE is a society for English-language professionals. We currently have about 350 members, including editors, translators, interpreters, copywriters, and language teachers and trainers. SENSE members generally live in the Netherlands, or have a professional connection to the country. SENSE was founded in 1990 by a small group of English-speaking editors. Their objective was to form a society that could address the problems of language attrition and linguistic isolation faced by English-speaking language professionals living and working in a non-Anglophone country. Since 1990, SENSE has attracted many native-Dutch speakers, who bring valuable perspectives on working in the English-language industry in the Netherlands. Our network has expanded to include members based in other countries. SENSE is forging contacts with sister organizations overseas, such as Mediterranean Editors and Translators in Spain and the Institute of Translators and Interpreters in the UK, to the mutual benefit of our respective memberships. One of the important benefits of belonging to SENSE is access to the members’ Library. This comprehensive resource is packed with links to useful information, including the many books and articles published personally by SENSE members. The digital collection includes the valuable Handbook written by and for members only. 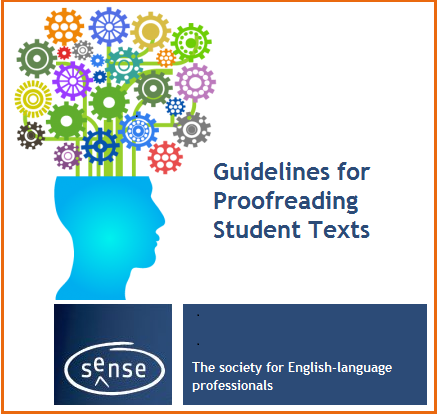 Other material is freely available to the public, such as the SENSE Guidelines for Proofreading Student TextsGuidelines for Proofreading Student Texts. SENSE publishes a regular blog and newsletter for members which you will find under Publications. The blog succeeds the quarterly ezine know as eSense. Feel free to explore our back issues for articles of interest to professionals in the language community.